Coverage: Friday 24 July, 19:00-20:00, BBC Three & 20:00-22:00, BBC Two; Saturday, 25 July, 14:20-17:20, BBC Two. Mo Farah said he may only defend one of his two World Championship titles next month after finishing fourth in the Diamond League 1500m in Monaco. Farah ran well in his second race back since doping claims against his coach Alberto Salazar but said he might not compete over 5,000m in Beijing. "I will do the 10,000m for sure and then we will see about the 5,000m," said the double Olympic champion. In the women's 1500m, Genzebe Dibabaset a new world record of 3:50.08. The 24-year-old Ethiopian took four seconds off her personal best to break Yunxia Qu's record of 3:50.46, which had stood since September 1993. Britain's Laura Muir finished fifth, breaking her own Scottish record in 3:58.66. Only 2004 Olympic champion Dame Kelly Holmes has run faster among Britons. On a night of fast races, Asbel Kiprop's winning time in the men's 1500m was the fifth fastest ever. The 26-year-old Kenyan won in a time of three minutes 26.69 seconds, making him the third fastest athlete over the distance. 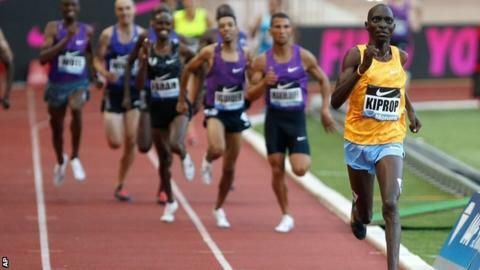 Farah clocked 3:28.93 - just a tenth of a second outside his personal best. The Briton said: "It was good to be in that company. I just could not close that gap on Asbel. Coming here I wanted to run hard, not just a race and it worked." Last week Farah won the 5,000m in Lausanne, though the victory was soured somewhat when he was later accused of swearing at rival Andy Vernon. Kiprop, a double world champion and 2008 Olympic champion, was less than a second outside the world record - and inside the required pace at 1200m - as he posted the fastest 1500m time for 14 seasons in a race that saw 11 athletes set personal bests. Farah was only 0.12 seconds outside his European record from 2013. He now has the fastest two times ever by a European. Justin Gatlin continued his dominance over 100m to win in 9.78 seconds. Britain's Christine Ohuruogu finished fourth in the 400m in 50.82 seconds behind American world indoor champion Francena McCorory of the United States, who won in 49.83 seconds. British 100m record holder Dina Asher-Smith came fifth in the 200m in 22.41 seconds in a race won by Candyce McGrone of the United States in 22.08 seconds.